I errored. I’m sorry. In early December I did a Throwback Thursday Cookbook review of The Good Cookie by Tish Boyle. I mentioned this book contains a couple of cookies that, in and by themselves, make this monumental cookie encyclopedia a “must-have” in your kitchen. I promised I would blog these Amy-Oe cookies before Christmas but I got jammed with other recipes and I just blundered. Belatedly, here is the recipe. 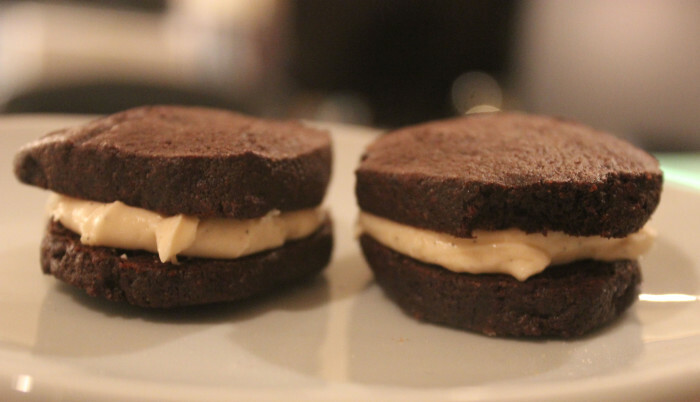 It’s a sandwich cookie, filled with Kahlua buttercream — which is a little recipe by itself you will surely use over and over again. Pound cake with Kahlua buttercream, anyone? The cookies here are cocoa wafers. You can make the wafers and just eat them, for they are quite lovely. You don’t have to make the Kahlua buttercream at all. Oh, for God’s sake, of course you do. The recipe below suggests make the dough, shaping it into a disk, rolling it out, and using a cookie cutter to make the cookies, which will then have perfect shape. I’m not big on dough rolling and saving the scraps and rerolling. Instead, I divide the dough in half and form two logs, trying to make them as round as possible. I don’t get perfect rounds, but I can match shapes and as long as they are stuffed to the rim with buttercream, frankly my dear, I don’t give a darn. Enjoy these cookies over and over again. In a medium bowl, whisk together the flour, instant espresso powder, and salt. Set aside. In the bowl of an electric mixer, using the paddle attachment, beat the butter at medium speed until creamy, about 30 seconds. Gradually add the sugar and beat until light and fluffy, about 2 minutes. Reduce the speed to low and add the egg, mixing well and scraping down the sides of the bowl as necessary. Mix in the vanilla extract. Gradually add the cocoa powder, mixing until blended. Scrape down the sides of the bowl. Add the flour mixture in three additions, mixing just until blended. Scrape the dough out onto a work surface and divide it in two. Shape each piece into a disk, wrap in plastic wrap, and refrigerate for at least 2 hours, until firm. Position a rack in the center of the oven and preheat to 325°F. Line two baking sheets with parchment paper. Place one of the dough disks on a very lightly floured work surface, sprinkle it lightly with flour, and, using a rolling pin, roll it out to a thickness of ¼ inch. Using a 2-inch round scalloped cookie cutter, cut out as many rounds as possible and arrange them ½ inch apart on the prepared baking sheets. Gather up the scraps, reroll them, and cut out more rounds. Bake the cookies, one sheet at a time, for 7 to 9 minutes, until they no longer look wet; the cookies should still be soft to the touch-do not overbake. Transfer the cookies to a wire rack and cool completely. Repeat with the remaining dough.